I don't know about you, but there are some days when I get home from work, I'm tired, I'm crusty from a long bus ride and I just don't feel like making dinner. As much as I love ordering in at the drop of a hat, it's a bad habit to get into, it's expensive, and it packs on the pounds a lot more than they really need to be packed on (note to self: hide scale). Not to mention all the sodium, nitrates and other crap that ends up in all that food. No good. This 'recipe' was from one such night....I can't remember why exactly I was tired (do I seriously even need a reason? ), but I wanted something totally lazy, but also still more on the healthy side than not. I also wanted ice cream (have you tried Haagen Daaz Dulce de Leche? SO FREAKING GOOD.....get each person their own pot, because you will eat it all). I was staring into the freezer, hoping that some sort of inspiration would strike me....and then I spotted the FULL grocery bag of blackened, shriveled, frozen bananas. Bingo. Hubs is always buying bananas when they are on sale for cheap (like 49 cents a pound). I hate bananas. I think all fruit should be at least somewhat crunchy, so their mushy wetness just grosses me out. So since hubs can never really finish an entire bunch of bananas, he always tosses the remainders in the freezer....in the sad, futile hope that I will someday successfully make banana bread out of them (I also hate banana bread). But you know one thing I can tolerate bananas in? SMOOTHIES! So here I had discovered this bag of extremely noxious looking black appendages....and right next to it was a nice big bag of tasty frozen berries (an excellent way to mask the banana flavour). Awesome. Turns out I also had yogourt and milk. - you get fibre and antioxidants from the berries. I like my smoothies to be pretty thick, so if you prefer a thinner or less frozen texture, consider upping the milk, or using fresh (non-frozen) fruit). Some might argue that this is breakfast fare, but for someone who is all to happy to have french toast for dinner....this is fair game for the evening meal. 1. If your hubby (like mine), has tossed the offending bananas into the freezer unpeeled, carefully cut the peel off. Cut each banana into four. Toss into the blender. I find that frozen bananas are surprisingly easy to cut - they have a solid ice-creamy texture. They are still gross though. 2. 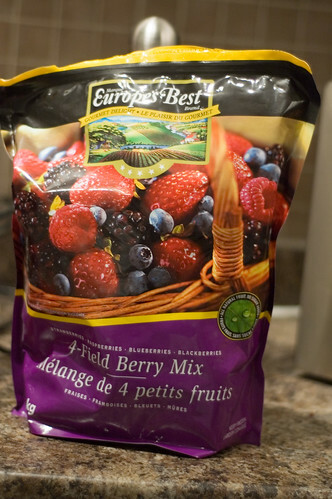 Toss the berries into the blender. 2. 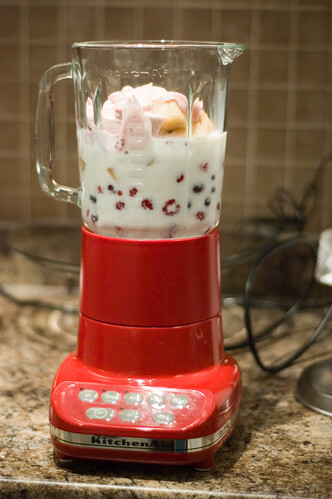 Toss the bananas, berries, milk and yogourt into the blender. Blend away until smooth. Depending on your blender, you may need to stop and stir - despite its snazzy appearance, my blender has the irritating habit of whirring away so enthusiastically that it puts an air bubble in between the blades and the thing I'm trying to blend...arg). This makes 2 huge smoothies, or four normal sized ones. I like to serve mine in a frosty beer glass. Eat through a large bore straw or with a spoon - your choice. :) I paired this with an everything bagel and tzatziki. If you're not preggo, you may want to consider a different food combo. a friend just gave me a great banana tip. 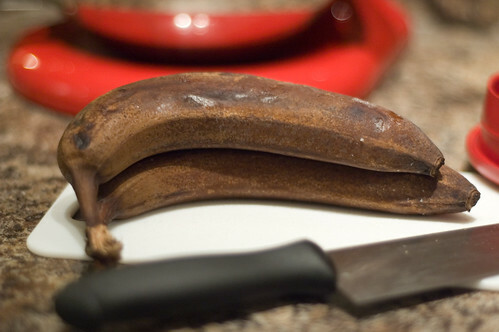 freeze bananas in their peel, but when defrosting, cut off the tip and squeeze out like toothpaste. i found this premashed my bananas and got rid of the stringy pieces. If you like the dulce de leche, you should try the new fleur de sel caramel. Totally worth the 5 bucks for one pint. Hey from Ottawa, too...yay for sunshine! Anyways, we have smoothies every weekend for breakfast but have done the lazy dinner thing from time to time. If you like them super thick, freeze the yogurt, too. 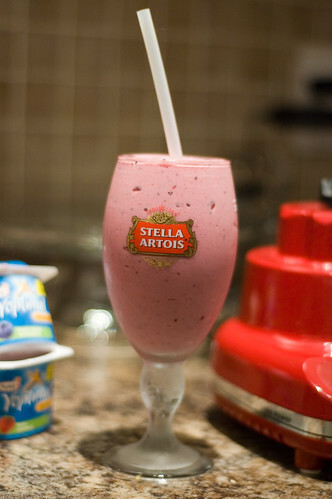 I use one single-serve yogurt cup per person, and I serve them in the monstrous beer glasses too. Smoothies have been made around here almost daily since I got my blender. Banana's don't make it to the freezer though. And a smoothie for dinner is sometimes just what a girl needs. I had one last week for that exact reason. 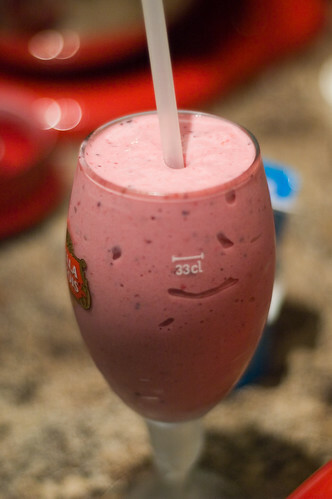 A tall glass of banana berry smoothie in a hot summer day is a heavenly drink. not only it is rich in taste and flavor but also is very filling cool. I love this tropical drink. thank you for shearing your post.